OAKLAND, Calif. -- In the summer of 2007, the owners of Harborside Health Center, then and now the most prominent medical marijuana dispensary in the U.S., were reflecting on their rapid rise. Steve DeAngelo had opened the center with his business partner in October 2006, on a day when federal agents raided three other clubs in the San Francisco Bay Area. "We had to decide in that moment whether or not we were really serious about this and whether we were willing to risk arrest for it," DeAngelo said. "And we decided we were going to open our doors. And we did, and we haven’t looked back since. The only way I’ll stop doing what I’m doing is if they drag me away in chains. And as soon as they let me out, I’ll be back doing it again." DeAngelo, looking at his desktop computer during an interview that summer, threw his hands up and shouted, "Yes!" Hillary Clinton, campaigning for president in New Hampshire, had just told a video-camera-wielding marijuana-policy activist that, if elected, she would end federal raids on pot clubs in California. That meant that all three leading Democratic candidates -- including the ultimate winner -- had vowed as president to leave DeAngelo and his business alone. Within a year of opening, the shop was bringing in $1 million a month in sales. President Barack Obama made good on his campaign promise shortly after taking office. "What the president said during the campaign, you'll be surprised to know, will be consistent with what we'll be doing in law enforcement," Attorney General Eric Holder said in March 2009. "What he said during the campaign is now American policy." In October, the Department of Justice followed up with what became known as the "Ogden memo" -- a missive from Deputy Attorney General David Ogden telling federal law enforcers that they should not focus federal resources "on individuals whose actions are in clear and unambiguous compliance with existing state laws providing for the medical use of marijuana." "We were so beside ourselves in so many ways that we were finally recognized by a government agency, that our press release was victorious," Sherer said. "What our nuance was, we said, 'Great, we have an administration that will have a dialogue with us, this is a major step forward.'" Some members of the medical marijuana industry, however, took a less nuanced view. "Instead, the reaction [from cannabis industry people] was, 'OK, we're all in the clear, it's time to expand our businesses and bring in outside investors,'" Sherer said. Encouraged by the Ogden memo and DeAngelo's public assertions of his million-dollar monthly revenue, medical pot shops flooded Montana, Washington, and other states. Legislatures in 18 states, plus the District of Columbia, have now approved marijuana for medical purposes. Twelve, including DC, have laws allowing dispensaries. Local officials in California's Mendocino County and in towns like Chico moved forward with plans to regulate medical marijuana as well. 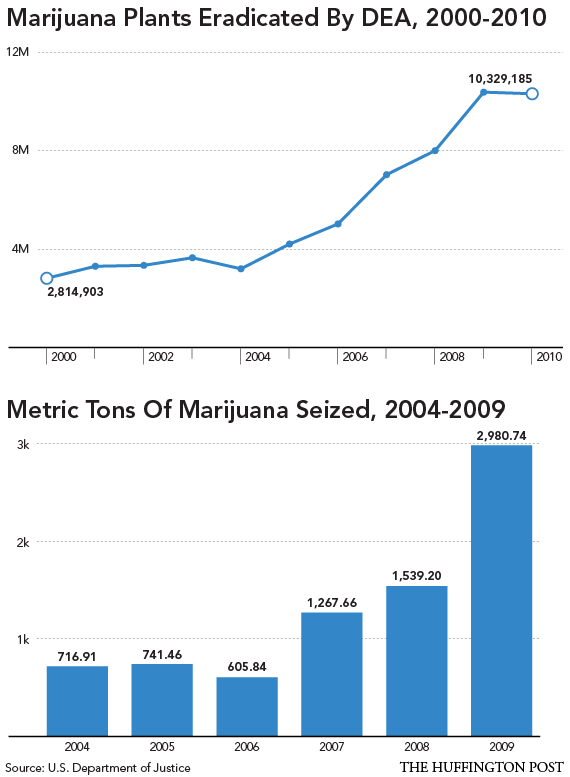 Before 2009, there were roughly 1,000 pot shops across the country. Today, there are 2,000 to 2,500, according to Kris Hermes, a spokesman for Americans for Safe Access. "Nobody can argue that the number of medical marijuana shops in California and Colorado didn't grow at an exponential rate directly because of this" Ogden memo, said a former senior White House official who worked on drug policy and, like other former and current members of the Obama administration, requested anonymity in order to speak about internal debates. The war has played out not just between federal authorities and the pot industry, but between competing factions within the federal government, as well as between local and state officials and the more aggressive federal prosecutors and drug warriors. As officials in Washington fought over whether and how to continue the war on pot, U.S. attorneys in the states helped beat back local efforts to regulate the medical marijuana industry, going so far as to threaten elected officials with jail. The willingness of elements within the Department of Justice, including its top prosecutors, to use their power in brazenly political ways is, in many ways, the untold story of Obama's first-term approach to drug policy. As president, Obama did his best to laugh off questions about marijuana. His own experience with weed had been positive, having spent his high school years hanging out with the "Choom Gang," a bunch of his stoner buddies in Hawaii. A young Obama coined the term "roof hits" to describe the act of sucking in pot smoke floating near a car roof, and was known to hog extra hits from a joint by jumping around a circle of smokers, snatching the weed and saying, "Intercepted!" The Drug Enforcement Administration and federal prosecutors, however, found nothing funny about it. "I believe there's this notion out there that the marijuana industry is just full of organic farmers who are peacefully growing an organic natural plant and that there's no harm associated with that," U.S. Attorney Melinda Haag told San Francisco public radio station KQED last March. "And what I hear from people in the community is that there is harm." Marijuana, Haag said, could stunt brain development in children and act as a gateway drug to other substances. It may also, she warned, lead to armed robberies at dispensaries and grow operations, putting innocent bystanders at risk. The raids led to images on the evening news of guns, drugs, and men in handcuffs. It imbued medical marijuana with a sense of criminality -- even though it was legal under state law -- and soured the political climate against it. Before the raids, state lawmakers had been debating two approaches: Repeal the voter-passed medical marijuana law altogether, or create a system of state-regulated and controlled dispensaries. The raids disabused Montanans of the notion that the federal government would allow states to regulate marijuana policy as they saw fit. The bill to sanction dispensaries was a casualty of the crackdown. Instead, the Montana legislature voted to repeal the law, but Democratic Gov. Brian Schweitzer vetoed it -- burning a branding iron through it at a public event. Lawmakers sent him a new bill leaving the law in place, but strictly curtailing it, and disallowing dispensaries. He allowed it to become law without his signature. People who felt they'd been baited into the business by the federal government cried foul and began fighting to stay out of prison. The team defending Chris Williams, a Montana medical marijuana provider who was arrested and charged with drug trafficking, reached out to a Huffington Post reporter, who had broken the news of Holder's announcement that he would lay off medical marijuana, asking him to testify. "Case law in our circuit indicates we may be able to introduce evidence concerning entrapment, such as quotes by govt. officials in news articles, if the writer of the article can testify to the authenticity of the statements," said an investigator. The judge in the case, however, ruled that defense attorneys could in no way mention the federal policy -- either Holder's statement or the Ogden memo. Williams was convicted and faces a mandatory minimum of more than eight decades in prison, though the judge has ordered mediation on the sentence overseen by a different judge, an unusual step. In a separate case now in court, former University of Montana quarterback Jason Washington, a hometown hero, was fingerprinted by the FBI while in the process of setting up a dispensary, apparently as part of an effort to rationalize the growing industry. Washington's lawyers hoped the FBI's documented cooperation with the establishment of the business would undermine the effort to imprison its owner. Last week, however, Washington was convicted, and faces two mandatory minimum sentences of five years each. Federal officials in Washington state ran the same play that had worked to such effect in Montana. As state lawmakers debated legislation to license dispensaries, federal prosecutors said they felt excluded. "There didn’t seem to be a recognition that the use and sale of marijuana is against federal law," Michael Ormsby, U.S. attorney for the Eastern District of Washington, complained to The New York Times. "No one [in the legislature] consulted with me about what I thought of what they were going to do and did I think it ran afoul of federal law." In early April, Democratic Gov. Christine Gregoire, anticipating the bill's passage, wrote a letter to the Justice Department asking what the federal response to the law would be. Ormsby and the other U.S. attorney with jurisdiction in Washington sent back a fire-breathing letter threatening to prosecute anyone involved with the dispensaries, asserting -- falsely -- that the Ogden memo was strictly limited to "seriously ill individuals," when in fact it referenced any individual who followed state law. The next day, on April 29, Gregoire vetoed the licensing bill. “The landscape has changed,” she explained. "I cannot disregard federal law on the chance that state employees will not be prosecuted." In Rhode Island, a U.S. attorney fired off a similar letter to Independent Gov. Lincoln Chafee that same month, as the governor considered whether to create state-run medical marijuana dispensaries, which the state legislature had authorized in 2009, before Chafee took office. the governor scrapped the planned "compassion centers." "Federal injunctions, seizures, forfeitures, arrests and prosecutions will only hurt the patients and caregivers that our law was designed to protect," Chafee said. Similar scenarios played out in Arizona and Hawaii, with raids and federal intervention followed by state officials backing off attempts to regulate dispensaries. The New York Times, rarely quick to ascribe motives to law enforcement on the news side, noted federal authorities' timing. "As some states seek to increase regulation but also further protect and institutionalize medical marijuana, federal prosecutors are suddenly asserting themselves," the newspaper wrote that May. For federal officials, the crackdown was necessary because things had accidentally gotten out of their control, said a former White House official. "If you read the memo, with the exception of a few words you maybe could've worded better, it's really not that different from current law," he said. "It took us by surprise, I will tell you, the way it was received in the beginning, and then the media ran with that narrative, that this was a change in policy and Obama's gonna allow medical marijuana shops. The smart legalizers ran with that too, even though the really smart ones knew, when you read that memo, there really wasn't much of a change from the Bush administration. All of a sudden, it took on a life of its own." Still, the consequences of the Ogden memo were unequivocal. Sherer traveled to Montana just before the crackdown to train owners on "raid preparedness." She asked rooms full of pot shop owners how many had opened their doors because of the Ogden memo. Nearly all raised their hands, she recalled. The Ogden memo, despite the press coverage -- including here at HuffPost -- held loopholes an aggressive prosecutor could drive a battering ram through. "Nor does this guidance preclude investigation or prosecution," it reads at one point, "even when there is clear and unambiguous compliance with existing state law, in particular circumstances where investigation or prosecution otherwise serves important federal interests." Pushed by political appointees, the Ogden memo, even with its loopholes, faced stiff internal resistance from career Justice Department prosecutors. "That's just not what they do,” said a former Justice official. “They prosecute people." "There was a fight to get a clarification," said one White House official. By the time the push for second memo started, both had already been promoted to the White House. Working in the White House Counsel’s office, they had no say as their replacements at DOJ drafted a memo many contend undermined the Ogden memo. "There was nowhere to hide. They had to get on the bandwagon," said the White House official involved in the process. The politics around drug policy do not move in a linear, upward direction like, say, civil rights issues. As civil rights are expanded, the politics become reinforcing, as people become normalized to the new equality and reject the old intolerance as immoral. It's by no means a smooth transition, but, for instance, the more gay weddings that are held, the more people come to accept the concept of gay marriage as uncontroversial. But drug politics move in both directions. Drugs of all kinds -- cocaine, heroin, speed -- were fully legal at the turn of the 20th century, then banned over the next several decades. The pendulum swung back in the 1970s, with more than a dozen states decriminalizing marijuana. Then back again toward criminalization. Drugs are not like gay or interracial couples, where familiarity breeds acceptance. More drugs can lead, instead, to a public backlash. Nearly everywhere that medical marijuana shops have proliferated, beginning in San Francisco in the early 1990s, there has been some negative public reaction. In the early communities, the public outcry was followed by a moratorium on new dispensaries and tight regulations on how they could operate. Well regulated shops have by and large been accepted where they have been allowed. It's that pregnant moment in between that the shops are most vulnerable. After 2009, the shops expanded faster than cannabis movement and industry organizers could keep up with. "People were telling themselves what they wanted to hear," namely that the Ogden memo provided immunity from raids, said Sherer. "The proliferation got really out ahead of advocates." The way to guard against a raid, said Sherer, had been to talk with neighbors, attend city council meetings, respond to complaints, and generally become a part of the community. "Make sure your community wanted you," Sherer said she advised businesses. "I've been training people for 10 years that the number one reason people get raided is community complaints. The telltale sign of federal activity is the local community rejecting the dispensary." Medical marijuana shops' protection had never been the law, it had been public opinion. With the perception in some local communities that the pot industry had gotten out of control, the DEA and U.S. attorneys were left with an opening. "The second [memo] was kind of like The Empire Strikes Back," a former DOJ official told HuffPost. "All the people who had been beaten the first time worked for several years to win one, and they won a round in the second one." Officially, DOJ took the position they were only further clarifying the Odgen memo, rather than throwing the guidance overboard. Its subject line promised it was merely "Guidance Regarding the Ogden Memo." Practically, however, the Cole memo gave U.S. attorneys more cover to go after medical marijuana distributors. The U.S. attorneys, "in unison, were saying, 'We're going to shut these down, this is the law.' Holder could've said stop, but he didn't," said the White House official. In October 2011, four California-based U.S. attorneys held a remarkable joint press conference effectively declaring war on medical marijuana. "We were all experiencing the same thing, which is that everyone was saying … the U.S. attorneys are not going to take any actions with respect to marijuana in California because of the 2009 Ogden memo," U.S. Attorney Haag told KQED. "So it's fair game. We can have grow operations, we can have dispensaries, we can do anything we want with respect to marijuana. … That was incorrect." "What was described to me was that they were going to be quote 'Walmart-sized.' And I was hearing that everyone believed that would be okay, and that my office would not take any action. And I knew it isn't okay. It is a violation of federal law," Haag said. "If you actually read the so-called Ogden memo from 2009 from the Department of Justice, what it says is that U.S. attorneys will not ordinarily use their limited resources to bring actions against seriously ill individuals or their caregivers. That's the direction we were given." Whatever the authors of the Ogden memo had in mind, the actual words they used said that resources should not be used to target "individuals whose actions are in clear and unambiguous compliance with existing state laws." "I didn't think it was fair to stand by, be silent, let people pull licenses in Oakland, put millions of dollars into setting up a grow operation in a warehouse and then come in and take an enforcement action," Haag said. The prosecutor's pursuit of fairness also took her to Mendocino County, where local officials had established an effective "zip tie program" to regulate its medical marijuana trade. Growers, after paying a licensing fee and submitting to police inspection, were given zip ties by the sheriff. Police officers who found bags of pot cinched by those ties then had reason to believe the product had been grown legally. The board decided to squash the program, but Haag's pursuit continued. She empaneled a grand jury and subpoenaed information from the county about its program, looking for the names of people who had registered as growers, as well as all financial information related to it. Mendocino has so far refused to provide the information and is fighting the subpoena in court. Dan Hamburg, a former member of Congress who's now a Mendocino supervisor, said that his fellow board members were well aware that if they created an ordinance, they'd be putting themselves at legal risk. "The Board of Supervisors knew the possibility that we could be charged by the U.S. attorney with aiding and abetting criminal behavior, or even a criminal conspiracy," he said. "However, my worry was, and remains, the possibility of forfeiture." Under forfeiture laws, the federal government can seize money and valuables connected with criminal activity. The feds have demanded to know how much money the county has made registering cannabis growers, which Hamburg and others suspect means they have their eye on it. Hamburg said it was just short of a million dollars, far more of a hit than the county budget, with "deteriorating finances," could withstand. "Our county doesn’t have a million dollars to turn over to the feds," Hamburg said. Hamburg had opposed the initiative, and opposed publicizing it, arguing that it would put a target on Mendocino and draw the ire of the federal government. Now that he's been proven right, he's backing his colleagues in defending it. The zip tie program "is by far the program that causes the greatest chasm of disagreement within the department," reads the audit. Critics "believe the program is illegal, runs counter to overall crime prevention in Mendocino County, is potentially criminal friendly, reduces morale, and is poised to bring more crime to the County and potential corruption to the department." The U.S. and Mendocino are scheduled to go to court on Jan. 29. Hamburg said he's optimistic, but the fight is draining county resources. "The president said he has bigger fish to fry than Washington and Colorado legalizing marijuana," Hamburg said. "But apparently his government doesn’t have bigger fish to fry than stopping Mendocino from attempting to regulate its marijuana situation." At a recent congressional hearing, DEA head Michele Leonhart was nearly laughed out of the room for refusing to say that marijuana was less dangerous than heroin. A new HuffPost/YouGov poll found just one in five people thought the drug war has been worth it. "We have two states that legalized it for even recreational use. So you tell me what Obama's policy is,” John Pinches, of Mendocino's Board of Supervisors, told HuffPost. “It's a mumbo-jumbo mess. It's time for the federal government to come up with a reasonable policy." Complicating things further has been the Obama administration's mixed signals on recreational pot. In theory, it shouldn’t matter whether states want to legalize marijuana for medical purposes or recreational ones. But DOJ officials considered proposed recreational marijuana laws as fundamentally different from those regulating medical marijuana. The public had supported Prop 19 for much of the race, but the measure ended up failing, 53 percent to 47 percent. Holder's intervention may very well have tipped the balance against it. It was a different story in 2012, when Holder kept quiet about legalization initiatives in Washington, Oregon and Colorado, a move one former Justice official said showed how quickly the politics were moving on marijuana legalization. An adviser at the White House at the time said that drug policy officials worried about tipping the electoral balance against Obama in Colorado, a swing state in 2012, and so declined to intervene in either Washington or the Mountain State's pot legalization initiatives, both of which passed by stronger margins than Obama won. "He was not as active as in 2010," the official said of Holder. "People were genuinely worried about Colorado. And you couldn't talk about Washington without talking about Colorado." The Obama administration never publicly backed Walsh's effort, nor did it intervene in the election. Obama won Colorado handily -- though 50,000 more people voted to legalize pot than voted to reelect the president. The implications of that margin were lost on nobody. California stands as an example of what may happen in other states if they continue with plans to legalize pot. In the spring of 2012, Richard Lee, Prop 19's primary funder, came under attack. The feds raided Oaksterdam University, a school he founded in Oakland, Calif., to teach industry skills, as well as his home. "This is one battle of a big war, and there's thousands of battles going on all over," Lee told HuffPost after the raid. "Before he was elected, [Obama] promised to support medical marijuana and not waste federal resources on this. … About a year and a half ago, the policy seemed to change. They've been attacking many states, threatening governors of states to prevent them from signing legislation to allow medical marijuana. They've been attacking on many fronts." In July 2012, the hammer came down on Harborside. The Justice Department served Harborside's landlords with commercial property forfeiture proceedings on the grounds that it violates federal law. The city of Oakland backed Harborside, and the dispensary fought back in the court of public opinion, bringing forward sympathetic patients who would be harmed by the federal government's actions. One of them was Jayden David, now 6, who lives with a rare form of epilepsy. In his short life, he's taken two dozen different medicines and has been rushed to the hospital in an ambulance 45 times. The boy's condition, however, slowly began to improve when he started using medical cannabis to ease his chronic pain and seizures. "He sings and smiles like a normal child now," DeAngelo told HuffPost, claiming the child has seen an 80 percent reduction in his symptoms and can now spend twice as much time at school. Harborside helped develop a specialized cannabis tincture for Jayden that doesn't have the same "high" side effects marijuana is commonly known for, he said. Because DeAngelo is an activist first and a shop owner second, his willingness to go to prison has enabled a firmer stand against the feds. And he's winning. In December, a state Superior Court judge delivered a sharp rebuke to the federal government: It could not enlist landlords in its drug war. In January, in a second victory, a judge ruled that Harborside's landlords could not order it to stop selling pot. The city of Oakland, on the happy end of more than $1 million in tax revenue from Harborside last year, filed suit against the federal government, demanding that it cease its prosecution of Harborside. The Justice Department may respond to the legalization of recreational marijuana in Washington and Colorado in several ways. One option would be to go after low-level marijuana users as scapegoats and seek a court ruling that would declare federal law trumps state law. One of the more extreme options, which officials acknowledge is currently being weighed by the department's Civil Division, would be to preempt the laws by suing the states in the same way the feds sued Arizona over its harsh immigration law. Federal authorities could sue Washington and Colorado on the basis that any effort to regulate marijuana would violate the federal Controlled Substances Act. Washington Gov. Jay Inslee and Attorney General Bob Ferguson met with Holder on Tuesday, but the U.S. attorney general declined to say whether the Justice Department would fight Washington's new marijuana law. Inslee said the state will move forward implementing the law. States have traditionally taken the lead when it comes to prosecuting low-level drug cases. Just 1,414 defendants across the country faced a lead charge of misdemeanor drug possession on the federal level in 2009, compared with 28,798 individuals who faced federal drug trafficking charges. Absent a massive influx of resources, the DEA, prosecutors and federal courts don’t have the capacity to handle small-time possession cases. The feds have to rely on their state-level counterparts. But beyond the practical considerations about enforcement, several former Justice Department officials contended the feds will have little choice but to preempt legalization laws because they represent a massive encroachment on an issue of federal importance. The officials said they didn’t see how the government could allow a law that so directly contradicts the will of Congress to stand, regardless of political implications. Whatever the Justice Department ends up deciding might matter less than whether the prosecutors choose to follow instructions. Regardless of memos emanating from Washington, it appears that the prosecutors are the ones truly calling the shots. CORRECTION: This article has been revised to clarify Montana Gov. Brian Schweitzer's action on legislation that would have repealed the state medical marijuana law. Schweitzer vetoed the repeal measure, then allowed a modified version to pass without his signature.